The Type 45S Micro-Single is an economical means for creating automatic, low-loss optical fiber fusion splices offering superb splicing portability. The front-to-back workflow is ideal for splicing in confined areas such as aerial or taut-sheath applications. The Type-45S typically requires less than 20 seconds to make an automatic fusion splice, and the average splice loss for identical single mode fibers is 0.05 decibels (dB). The Type-45S is equipped with an on-board splice protection heater that is used to heat shrink a fiber protection sleeve over a completed splice. A 60mm fiber protection sleeve can be fully shrunk in less than 75 seconds. Both power sources, AC adapter and battery, are available. The portable capability of the T-45S has been improvedusing the slot-in AC adapter/battery. Fiber loading without fiber holder. Newly developed heater is capable of high speed heatingoperation. 40 consecutive splicing/heating operation with one fullycharge battery. The mounting of a large wind protector enables splicingoperation in 15m/s strong wind. 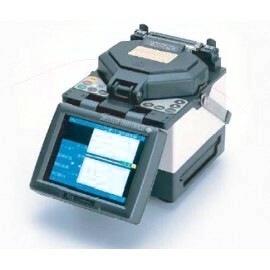 5.6 inch large TFT color monitor provides clear fiber imageeven in direct sunlight. Protection glass attached to mirror gives you much easiercleaning and maintenance. White LED illumination enables identification of a ribboncolor and fiber loading even at dark places.